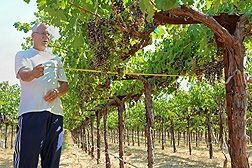 ARS scientists are saving water in California's vineyards by using satellite data and computer models to better manage water resources. Bill Kustas and Martha Anderson are fine-tuning computer models at the ARS Hydrology and Remote Sensing Laboratory in Beltsville, Maryland, to help vineyard managers determine how much water to apply and when to apply it. The models tap into satellite data that measure land surface temperature providing information about soil and vine moisture levels and rates of water use or "evapotranspiration." With water supplies critical in California, the state's nut and fruit orchard operators are also likely to benefit from these efforts, Kustas says. Over the next two years, the ARS researchers plan to develop a daily digital map of evapotranspiration in California's Central Valley, which includes some of the world's most productive agricultural lands, at a resolution that will give growers a firm grasp of conditions in specific areas within their fields.